We’ve gotten hooked (no pun intended!) on Caesar Salads lately. So fresh and so yummy that we’ve had one with almost every dinner! So we decided to up the protein and add in some salmon to this beautifully fresh salad, and we created the Salmon Caesar Salad. We had some leftover Cedar Plank Grilled Salmon the other day so I decided to throw the leftovers into a nice salad for lunch. It was so good I decided I had to make it again and shoot some pictures to share it with you. Man, I mean it was so yummy that I’d eat this all the time! And, talk about good-for-you! Fresh spinach. Fresh salmon. 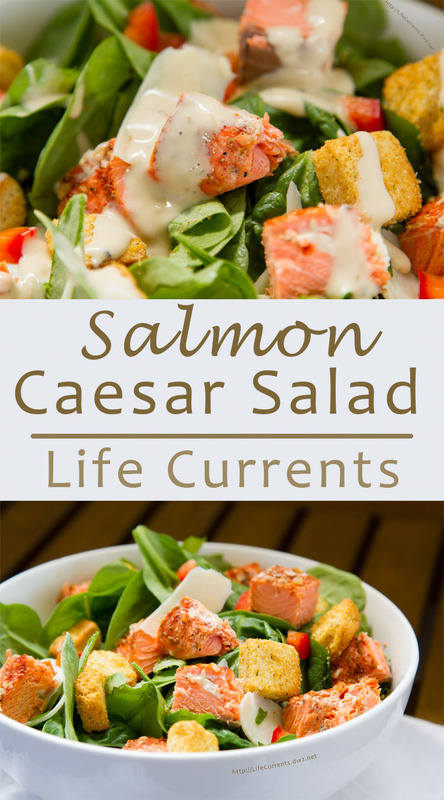 All kinds of goodness going on in this Salmon Caesar Salad! This Salmon Caesar Salad is the perfect way to use leftover cedar plank grilled salmon. Take a look at my instructions here on how to make Cedar Plank Grilled Salmon (so delicious!). I made my Caesar Salad with spinach. I love the taste of fresh spinach in this salad. And, spinach is a nice healthy dark leafy green. Spinach isn’t traditional to a Caesar Salad though, usually the green of choice is romaine lettuce. Romaine is nice and crunchy. Feel free to use either, but the flavors of the salmon and the spinach are awesome together. We’ve just been using bottled Caesar Dressing. And, we’ve found that Newman’s Own Creamy Caesar is a great dressing. Now, I like my salads a little dry, and Dan likes his to have a little more dressing on that I do. So, feel free to use as much or as little dressing as you’d like on this. If you’d like to make your own Caesar Dressing, I’ve collected a few recipes from my blogging buddies. Take a look at these yummies! Place the spinach in a large bowl, and top with the Salmon, red peppers, croutons, and Parmesan. Drizzle with Caesar dressing. This looks so good! I love homemade caesar salad! I’m with you on using up leftovers. Great post! I love that you used Spinach in your Caeser Salad. I think that is a fantastic idea. YUM! Can’t wait to try it. I love love love salmon and to use it in salad is great! Nice colours in the dish too! Thanks for the share. Oh girrrrrl! This salad has my name alllll over it! Perfection! !